Also known as European Holly and Curly Photinia, this plant has burgundy to red tops over green. Its leaves are delicately serrated and wavy atop strong, dark red branches. Mature lower leaves show deep green color. Popular foliage for color and textural interest in flower arrangements. 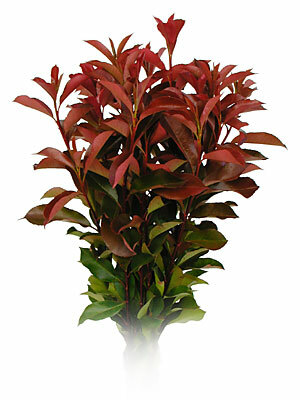 ORIGIN: Photinia is native to the warm, temperate regions of Asia, from the Himalayas to Japan to India and Thailand. CARE & HANDLING: Trim 1/2-inch to 1-inch off the stems (it is especially important to trim stem ends if the Photinia appears fatigued). Place stems in a clean container or vase filled with fresh, tepid water. If any leaves sit below the water line, remove them. Change water and re-cut stems every few days or as needed.